Ivan Passer’s beguiling and beautiful INTIMATE LIGHTING / INTIMNI OSVETLENI, one of the finest examples of the Czech New Wave, makes its mark again as part of The Czechoslovak New Wave: A Collection, a Limited Edition 3-disc set released this week by Second Run. L.K. Weston reviews the film and the DVD. Intimni osvetleni/Intimate Lighting is available as a stand-alone DVD from Second Run, and has also been released as part of a three-film box set titled The Czechoslovak New Wave: A Collection, which also includes Jan Němec's Démanty noci/ Diamonds of the Night and Juraj Herz's Spalovač mrtvol/The Cremator, which have been reviewed separately. "Music expresses that which cannot be put into words and cannot remain silent." The Czechoslovak New Wave occupies a brief five-year space on the calendar, but it left behind a rich cinematic legacy of beautifully crafted and important films that changed the shape of world cinema. As an introduction to that incredibly fertile period of creativity. Second Run has brought together three seminal films from those years to form The Czechoslovak New Wave: A Collection – and what a collection it is. Beginning with Jan Němec's Démanty noci/Diamonds of the Night, and ending with Juraj Herz's Spalovač mrtvol/The Cremator. Ivan Passer’s Intimate Lighting/Intimni osvetleni sits between the two – a bridging gap between two narrative and thematic extremes. Cumulatively, they are testament to the fact that creativity can indeed flourish, no matter how Government censorship might try to stifle it. 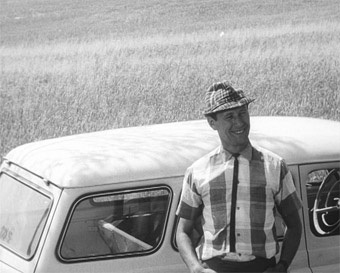 Released on its own by Second Run in 2006 following the film’s belated success at The Berlin Film Festival in 2002, Intimni osvetleni/Intimate Lighting is one of Passer’s earliest films but the last to be made in his native Czechoslovakia before he emigrated to the US in 1969, following the Soviet invasion, remaining there ever since. An exercise in beauty and understatement, Intimate Lighting is a founding text for the Czechoslovak New Wave, perhaps to the point of cliché. 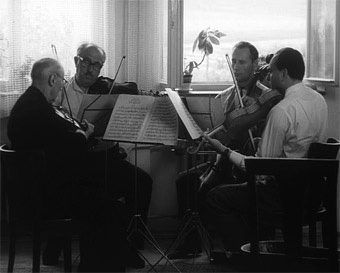 Filmed on location in Tabor with mostly non-professional actors during the summer of 1965, Intimate Lighting is a freewheeling film that explores the friendship between two musicians, cellist Petr (Zdenek Bezusek) and violinist Bambas (Karel Blasek), as they prepare for a local concert. The old friends are reunited when Petr returns from Prague to his hometown with girlfriend Stepa (Vera Kresadlova, the second wife of Passer’s friend and frequent collaborator Miloš Forman), ready to take his place as the soloist in the orchestra. As rehearsals continue, Petr and Stepa settle in with Bambas and his family, and the two men attempt to reconnect. However, the passage of time has not been kind to their friendship; the divergent paths their lives have taken have left leave them unsure how to relate to each other, and tensions quickly emerge. On one side is family man Bambas, struggling to talk with his younger and more successful friend as he once did. On the other, is Stepa, concerned that Petr’s friendship with Bambas overshadows their relationship. She accuses Petr of caring more for Bambas than he does for her. With his past and present in collision, Petr is left with the difficult task of trying to reconcile the two parts of his life and the very different people in it. Intimate Lighting is a film without a plot in the traditional sense of the word. It feels like nothing at all happens, and the film ambles along at a languid pace that stretches its seventy-two minute runtime into something else, but doesn’t waste a single minute either. The writing trio of Passer, Václav Jester, and Jaroslav Papoušek (who also co-wrote Forman’s A Blonde in Love /Lásky jedné plavovlásky and Horí, má panenko/The Fireman’s Ball) fashion their script around the ebb and flow of every day life in all its minutiae – its intimate as the title suggests – rather than something built upon neat foundations that culminates in a solid narrative pay off. Arriving at the midpoint between Ingmar Bergman’s Det sjunde inseglet/The Seventh Seal and Claude Berri’s Jean de Florette, it’s the perfect cinematic marriage of the two in tone and aesthetic. Things play out as a series of vignettes, some of which are more fully realised than others. Conversations are left hanging; visitors to Bambas’ household arrive unannounced and their connection to the characters remains unexplained; and there are frequent scenes with a lonely Stepa wandering around the garden, idling away time when Petr is in rehearsal. When couched in those terms, it makes Intimate Lighting easy to dismiss as something rather scrappy, slapdash, and lacking in clarity, but to cast the film off as another example of overblown critical rhetoric would do it a disservice. Its unfinished and unshaped nature lends the film a naturalistic quality that chimes with the overall warmth and affection with which these characters lives are depicted. Stylistically, the film is just as finely balanced. The beautiful crispiness of Miroslav Ondříček’s black and white images are complemented by Josef Hart and Oldrich Korte’s original score. Music is, rightfully, a strong presence, acting as the film’s backbone (something foregrounded nicely by the restoration work on the sound track), with the orchestra’s practice sessions often bridging sequences. At times, it feels like events are being shaped by the characters themselves rather than by Passer and his editor Jirina Lukesová (who would later work with Jirí Menzel on Rozmarné léto/Capricious Summer and Skrivánci na niti/Larks on a String). It’s easy to imagine the whole film as being drawn from Petr’s recollections as he travels back home with Stepa to Prague. Though the rose-tint can’t be seen, it can certainly be felt. The real joy of Intimate Lighting comes in the contrast between its almost magical, sometimes dreamlike quirkiness – with its tightly woven thematic threads of love, loss, and perception of the self – and the palpable tension between past and present. These are by no means new preoccupations, but through focussing on the relationship between Petr and Bambas, and the differences between the two, Passer makes these broad, oft-explored ideas something concrete and relatable. 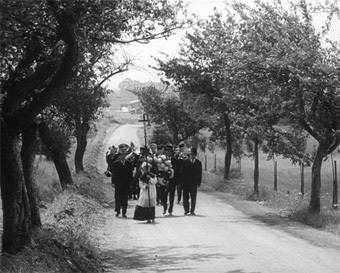 The sage, philosophical outpourings peppered throughout the film could’ve given it an air of aloof pretentiousness, but, instead, the musings of Bambas’ mother and father (played by Vlastimila Vlková and Adelheid’s Jan Vostrčil respectively) come off as warm and wistful, adding to rather than detracting from its charm. Similar to the early work of Miloš Forman, Intimate Lighting is, in comparison to later films, apolitical. Presented without any agenda or judgement, it represents a particular moment within Czech cinematic and social history; one that, in light of real-life events which followed its making, seems all the more golden. A cinematic whisper rather than a bang, it could all too easily pass the viewer by, and although perhaps not yet as well known as other films within the Czech New Wave output, such as Ostre sledované vlaky/Closely Observed Trains or Miklós Jancsó’s Még kér a nép/Red Psalm, that’s more than likely to change. Though it’s a much gentler film than either Diamonds of the Night or The Cremator, it’s no less deserving of attention. Casting a slow-burn glow that engages and enchants in equal measure, Intimate Lighting is imbued with a soulful, ever present melancholic tinge that brings a surprising level of depth to a film that first appears altogether more light and inconsequential. Part showcase of the period and part blueprint for all that would follow, it retains a majestic, emotionally resonant quality that hasn’t dulled over time. Framed approximately 1.27:1, the transfer here has been made from a restored and remastered print, and it looks terrific, boasting a very impressive level of detail and sharpness for a DVD, a flattering but still punchy contrast range and solid black levels and no burn-outs on the highlights. Some dust spots are still present, but on the whole this is also a very clean transfer, and there are only the smallest trances of slight damage on a couple of reel changes. There is some slight banding on one shot of headlights shining into the camera and illuminating the night sky, but otherwise there are no obvious compression issues. Another first-class job from Second Run. The Dolby 2.0 mono soundtrack has also undergone restoration, and despite the sort of range restrictions you would expect of a film of this vintage, the results are very pleasing, being clear, distortion free and lacking any distracting background hiss or damage. Intimate Lighting arrives both digitally remastered and restored, with an improved English subtitle translation, along with a mono soundtrack as Passer intended. As is the case with many Second Run releases, the real draw for purchase comes in having the opportunity to see the film at all. In our all-access culture, it’s easy to take the availability of films for granted. Filmed in 2005 in Los Angeles, this is a real treat, since it’s the first time Passer has spoken about Intimate Lighting on camera. It’s an all-encompassing discussion, exploring everything from the film’s inception to the reaction it received upon release. Beyond the context of Intimate Lighting, Passer speaks with great warmth and affection of the filmmaking landscape, making the pre-1968 environment sound positively idyllic. There are also some particularly fond words for his frequent collaborator, famed cinematographer Miroslav Ondříček. Though comparatively shorter than the essays usually found within Second Run illustrated booklets, don’t be fooled; the piece on Intimate Lighting by writer and broadcaster Phillip Bergson is certainly a case of quality over quantity. An easy and accessible read that’s a fine introduction to both the film and Passer himself. The essay on Intimate Lighting written by Dr Jiří Voráč (in Czech), which is referenced by Bergson in the booklet, can be read here. A celebration of rural Czechoslovakia and the beauty of everyday life, Intimate Lighting is a masterful film, which showcases the formidable talents of Ivan Passer and his cinematographer Miroslav Ondříček. Though this founding film of the Czech New Wave may not have the political punch of the films that followed it, the unassuming mix of wistfulness and comedy makes for something that’s equally powerful. Essential viewing.